Back of card: A light-grayish brown, with white border. In the lower half of the center, two men on camels before the Great Wall. This is inverted on the top of the card, so this deck may be inverted. Booklet included: Yes, stapled, 64 pages. Measurements: 2.6 x 4.75 inches, or 65 x 120 mm. Instructions in English, Italian, Spanish, French & German. There are instructions for three spreads: The first for a pyramid of ten cards, the second of five rows of six cards each, the third, three rows of four cards each. Comments: Marco Polo, a Venetian, lived from 1254 to 1324. As a young man he spent some twenty years in the Orient, including a number of years at the court of Kublai Khan. He returned to Italy in 1295 & dictated his memoirs while in prison in 1298. They were an immediate sensation throughout Europe. I confess that I am not familiar with his exploits, nor do I know a great deal about traditional Chinese culture, so I am not the best person to comment on this deck. One interesting feature of the major arcana: The artist has put two scenes in most of the 22 major arcana tarot cards. The larger is the Chinese version, the smaller is the Western one. One may see this in the three major arcana cards shown above. On the Magician card, a Chinese youth searches for a "solution" by writing characters on parchment, while, in the background, a western magician studies an alchemical text. The Wheel shows four Chinese dragons around the traditional Yin-Yang symbol, while, below it are four western sages with the ROTA (TAROT) wheel. The Hanged Man shows an oriental pearl diver suspended by a rope, with a sunken western galleon in the background. 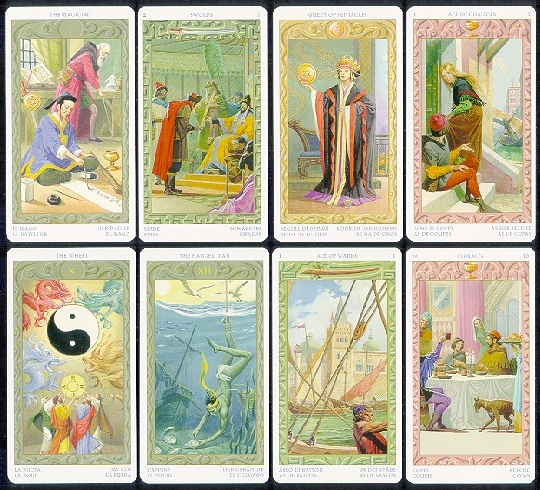 Other major arcana cards show western figures presented to Oriental ones. The Hierophant has a monk with a golden statue of the Buddha in the foreground, a crucifixion visible through an arch in the background. The Death card shows Death on horseback with a small baby, while Catholic & Shinto priests worship below it. Two images on one card is an enriching idea and this deck is an excellent example of how to put contrasting ideas on the same card & make them both work. Magician: Will shall make initiative successful. The High Priestess: Reasonable advice will increase knowledge. The Empress: Confiding in oneself will sharpen the intellect. The Emperor: Firmness will increase strength.